The easiest way to distinguish between residential and commercial garage doors is simply by the type of building it is attached to. But here, we will discuss some of the other big differences between the two types of doors. 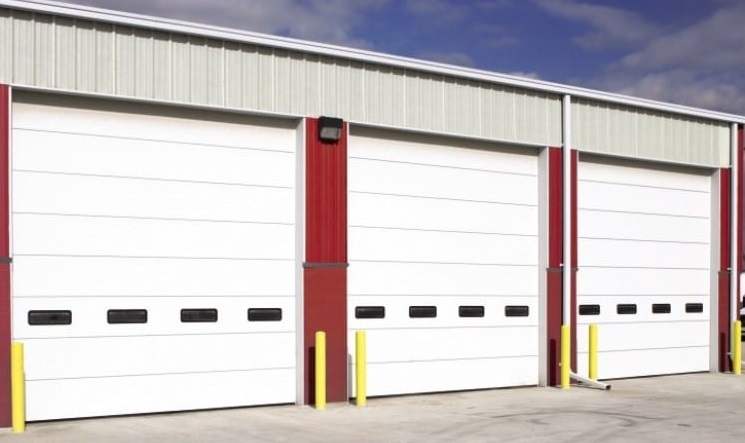 One of the biggest differences between commercial and residential garage doors is that residential doors tend to be more focused on looks than commercial doors. This is because many homeowners tend to want a garage door that is aesthetically pleasing, whereas commercial or industrial building owners are more focused on function. This is because a residential garage door tends to have a greater effect on a home’s overall curb appeal, and eventual resale value. To improve the appearance of residential garage doors, often windows, designs, or color options are carefully selected. Because commercial doors are more concerned with functionality, they tend to be plainer and simpler. The majority of commercial doors are of the conventional white roll-up or flat designs. One of the most obvious differences is that commercial doors tend to be a lot bigger than residential doors. Residential doors tend to have a standard height of seven feet and vary between eight and nine feet wide. Although these are the standard sizes, homeowners with an RV, boat, etc. can special order a garage door that can be as tall as 12 feet high. Where residential doors come in standard sizes, commercial doors do not. The size of a commercial garage door is going to be dependent on its application. Commercial buildings that use a lot of oversized machinery will need a larger door than commercial buildings that do not. Homeowners can purchase a garage door in different materials—wood, steel, fiberglass, etc. The deciding factor on what type of material is going to be best will depend on the homeowner’s personal preference and budget. Wood doors offer better curb appeal, while steel doors are long-lasting. On the other hand, commercial doors are primarily only made of aluminum or galvanized steel. This is because both materials are extremely durable and offer the security and longevity that commercial business owners are searching for in a garage door. Residential doors are designed to only be opened a couple of times each day, whereas commercial doors are designed to be opened and closed several times a day. As a result, a residential garage door opener is made to endure being open and closed only a few times a day. Whereas a commercial door opener is designed to open and close a door multiple times a day. Additionally, commercial doors are designed to operate more quickly and efficiently. Another major difference between residential and commercial garage doors is the cost. Commercial doors cost significantly more to install and repair than residential doors because they are designed for commercial-level security, and are often larger in size. Because commercial doors are more expensive, they are rarely used in residential applications. On the surface, both residential and commercial garage doors appear to be the same, when in fact they do have some big differences. Whether you are looking to replace your existing garage door or need repairs, Thomas V. Giel Garage Doors can do it all. Since 1950, Thomas V. Giel Garage Doors has been providing new garage doors and repairs to homeowners and business owners across Pittsburgh.